Understanding how classroom acoustics can impact on the learning abilities of children with hearing loss is the focus of an online training module recently developed by Macquarie University. 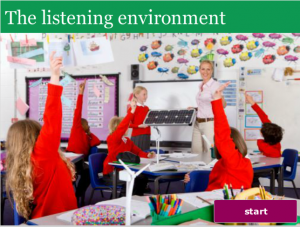 Available from the HEARnet Learning website, the Listening Environment (link: https://hearnetlearning.org.au/course/view.php?id=37) training module provides teachers with practical information about classroom acoustics. The module features helpful advice on how to measure a classroom’s acoustics and what steps can be taken to reduce their noisy impact on learning. The module would also be of interest to anyone who works in a noisy environment and wants to know what they can do to make their workplace quieter. The Listening Environment was jointly developed by the New South Wales Department of Education and Communities, Macquarie University’s School of Audiology and Institute of Early Childhood, along with The National Acoustic Laboratories. Please note, you do not have to be a registered HEARnet Learning user to access this module. Simply follow the link above and then click on the ‘Start Button’ to start the module.